Hey Gang! 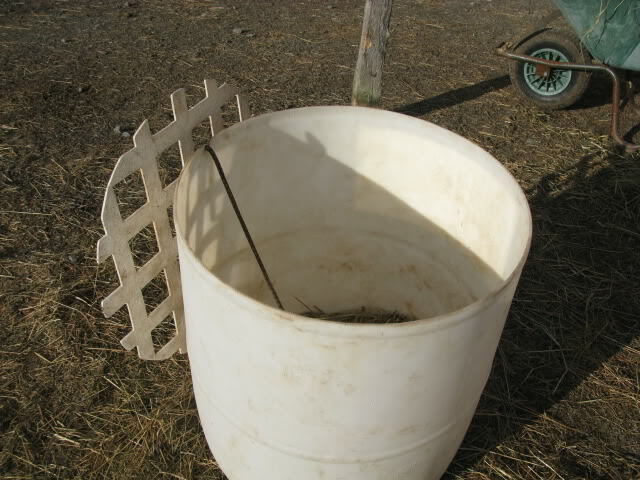 A while back I told everyone that Gord had made some hay feeders for me to help cut down on the amount that the critters waste, as well as to deal with hay blowing around. I have FINALLY gotten around to getting the pictures, so here they are. We took large plastic barrels and cut the tops off them. We also made one a little shorter for the pony but have found that the full sized ones are fine for him. 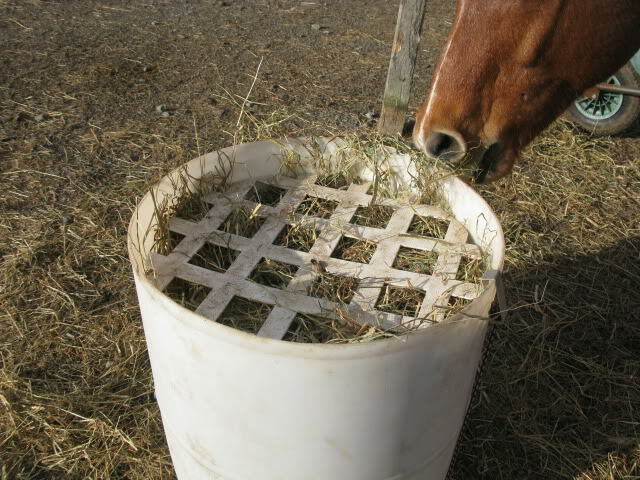 Each barrel can hold about 4 flakes of hay - depends on the texture of the hay. 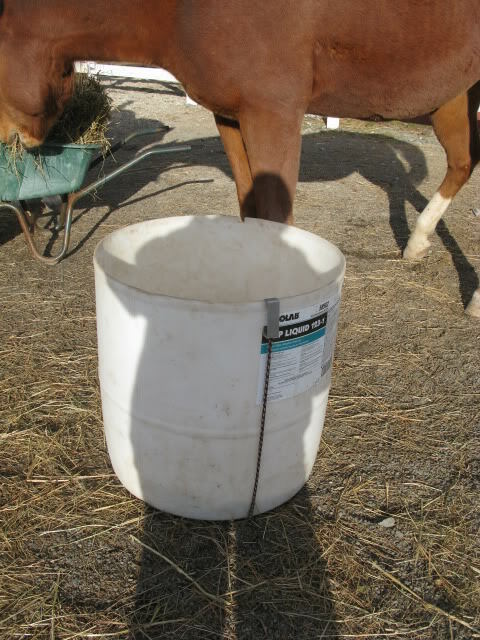 I shake the hay out into the barrel, which helps with any dust, and also makes it easier for the horses to get the hay out. The top is made from plastic lattice. We aren't sure how it's going to hold up through the coldness of the winter but I'll let you know how it goes. Gord drilled some holes through the bottom of the barrel to allow for drainage. He also put a hole in the middle of the bottom to run the bungee chord through. 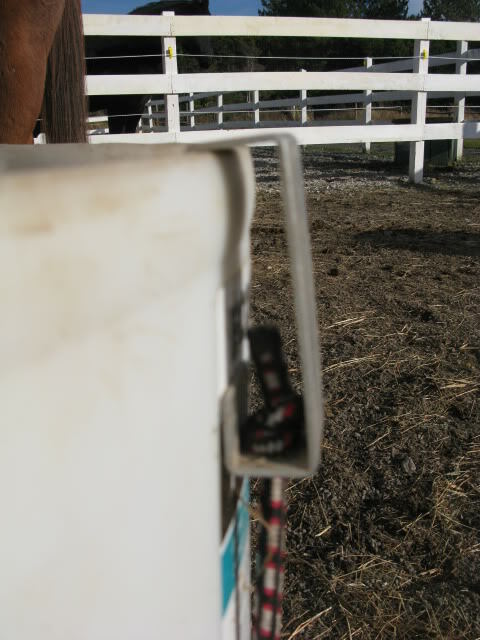 The bungee chord is what holds the top in place as they eat. Sometimes they do manage to tip the cover to the side, which gives them easier access. A few times the chords have come undone and they've taken the covers right off. If I give them loose hay, and hay in the feeders, they prefer the hay from the feeders. I think there's a little bit of sport involved for them. They move the feeders all around, tip them over, fling them, etc - so far they are holding up well. Gord made up some hooks at work to clip onto the side of the barrel. First we tried the bungee chords that come with the plastic hooks, but it didn't take long for the plastic hooks to break. These ones work much better. The horses have stepped on them but we are able to just bend them back into shape. You just tie one end of the bungee chord to the centre of the lattice, feed it inside the barrel down through the hole in the bottom. Fasten the hook onto the end of the bungee and then pull the chord up the side of the barrel and hook the hook onto the side. They are fairly easy to load. 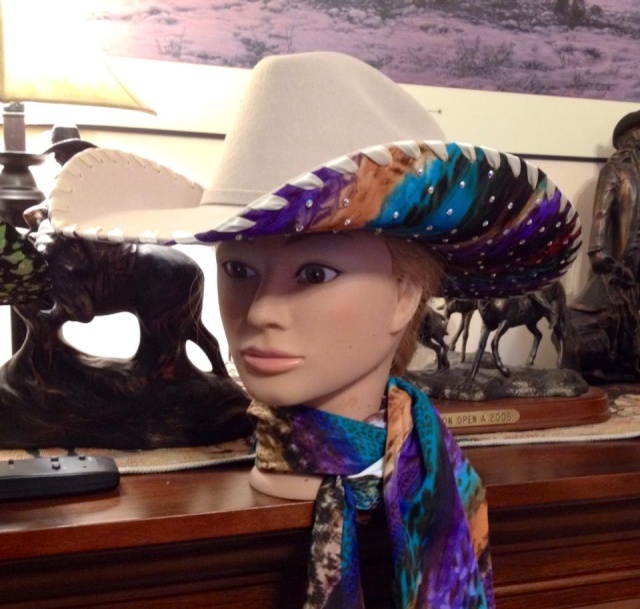 I was also thinking that they'd be great for anyone who has to carry hay to their horses in the winter. Bring the barrels up to the barn, load them up and then either roll them or just slide them over the snow. You may even be able to hitch a ride on one! Cool! These look so much easier to fill then the hay pillows I made. Can you post a video of how you secure the top? One full barrel would fit approx 4-5 flakes in. 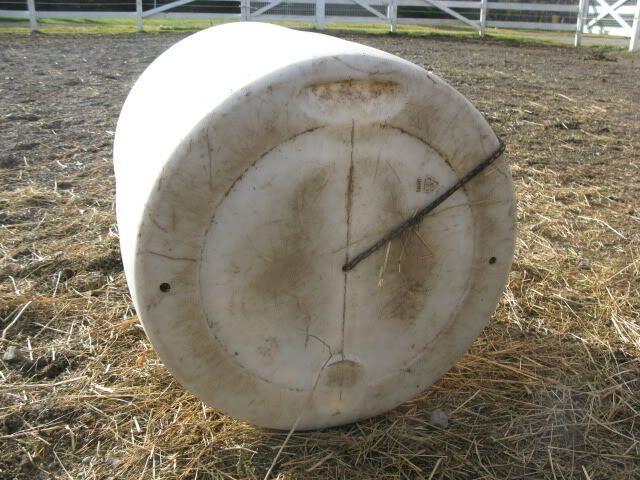 In each paddock I have a full sized barrel and a half sized barrel. For the pony and horse it does them the day (7 am - 8 pm). For the paddock that has two full sized guys in it I have to refill them around 4:00 or so. I'd say a full sized one would last an average sized horse 12 hrs. It takes them longer to eat because they have to work at it! I went withthe plastic lattice instead of wire because I was afraid the wire may hurt their muzzles. Skipper and Reo prefer to eat out of the same one at the same time. Stretch and Thunder are always at seperate ones - they don't share as well! I'll try to get a video tomorrow showing how I fill them and fasten the hook. If it stops raining that is! Rumour has it that the rain will stop sometime tonight and we may get some SUN tomorrow. I'd be satisfied with the rain stopping - sun would just be a bonus! Love them! If I had my own place I'd order a few! These look really cool and functional. But I know my Eko would make short work of them.. be like giving a cat a toy mouse. He is such a "turd" some times. Ikeda and Shadow would be fine with one.